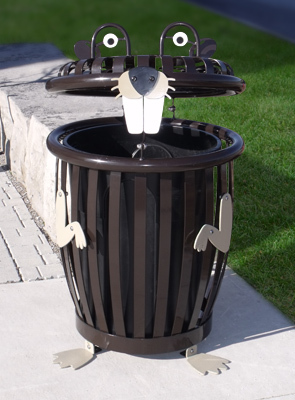 This fun beaver shaped outdoor litter receptacle encourages children to properly dispose of their trash. Kids will enjoy having this friendly litter creature at school playgrounds, zoos, or parks. Comes complete with eyes, ears, teeth, paws, and an expanded steel tail in the back. Durable ribbed steel slats enclose a removable, black 34 gallon rigid liner. Liner is easily accessible through the hinged lid which is shaped as the beaver's head. To remove liner, remove bolt from bottom to lid strut and carefully tilt lid back. Receptacle is portable or can be surface mounted for permanent placement. Available in the color scheme as shown. The state of the art finishing process used on the receptacle combines the application of an 'Electrocoat Zinc Rich Primer' with a durable polyester powder-coat top layer to ensure every crevice and joint is completely sealed, providing full protection against	corrosion and weathering. Receptacles are finished in either a gloss polyester powder-coat finish.